Connecticut’s education system caters to high school students who want to get a head start in their career and technical education, while also providing ample opportunity for vocational training at the postsecondary level. No matter the level, vocational and trade students in Connecticut can get the education and training needed to earn high-skill, high-wage jobs, such as those in the medical and technical fields. Read on to learn more about vocational and trade schools in Connecticut and the specific career opportunities that a technical education can bring. 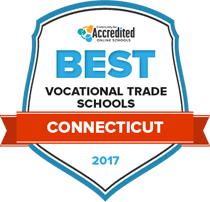 The following ranking provides a comprehensive overview of the vocational and trade schools throughout Connecticut. Community colleges and career colleges in Connecticut provide in-demand programs, including those in construction and healthcare. Read on to explore our rankings of Connecticut schools; the list is based on tuition, financial aid availability and other important factors. One of 12 community colleges in Connecticut, Gateway Community College has accredited certificate programs serving careers in engineering, business office technology, early childhood education, information science, and health career fields. Business office certificates focus on customer service, information processing, bookkeeping and medical office administration. In education, students can complete their credentials in childhood development, infant/toddler development, and early childhood special education. Career certificates are also available in automotive technology, clean-water/wastewater management, substance abuse counseling, culinary arts and computer assisted drafting (CAD). Gateway participates in programs offering financial aid, scholarships and veteran’s benefits. Manchester Community College offers more than 90 undergraduate educational programs and supports its students with academic advising, career planning, counseling, tutoring, and new student orientation programs. MCC evaluates its career certificate programs on a continuing basis to ensure they serve the changing needs of the Connecticut workforce. Certification programs build professional credentials and prepare students to take national and state certification examinations. These include curriculum in business (accounting, marketing, and business administration), health office technology (electronic records, insurance processing, and transcription), information technology (programming, networks, game design), criminal justice, hospitality/tourism management, manufacturing, dental assisting and early childhood education. Over the last five years, Naugatuck Valley Community College has awarded more than 2,000 academic certificates of proficiency in more than 50 career groups. The disciplines with the highest interest at the college include the liberal arts and sciences, business management, human services and nursing. Certificate programs are offered in 2D/3D computer-aided drafting (CAD), accounting, administrative support, advanced manufacturing machine technology, alternative energy systems technology, automotive fundamentals, child and family services, computer networking, construction technology, criminal justice, finance, early childhood education, fundamentals of machine technology, horticulture, legal studies/paralegal, management information Systems (MIS), LEAN manufacturing, marketing/electronic commerce, and supply chain management. Vocational students and professionals seeking advancement can build the right credentials through the undergraduate certificate programs available at Three Rivers Community College. The certificate curriculum is designed to satisfy vocational requirements set by the professions through the college’s 6, 15, and 30-credit-hour programs serving more than 6,000 students. Certificates are offered in accounting, entrepreneurship/small business skills, CAD design, early childhood education, communications and customer relations, environmental health and safety, construction management, criminal justice, hospitality/restaurant management, laser and fiber optic technology, security/loss prevention, mapping and surveying, casino management, business information systems, and supply chain management. Three Rivers has an open admissions policy. Hartford’s Capital Community College has tailored its undergraduate certification programs to meet the career and vocational requirements set by employers in pre-professional and trade fields. For example, the Early Childhood Education certificate requires 12 hours of study and prepares graduates to work as teacher assistants to the under-five year-old school population. The Allied Health Science certificate program, on the other hand, requires students to complete 30 credit hours including English composition and mathematics. Prospective students can also choose among certificate programs in business and accounting, fire science, emergency response and social services. Middlesex Community College has awarded more than 640 certificates since it opened its doors in 1966. MxCC currently offers career-oriented certificate programs in accounting, advertising, broadcast communications, business skills, entrepreneurship, corporate media production, customer service management, early childhood education (child development CDA credential), entrepreneurship, health information management, computed tomography and mammography, juvenile justice, manufacturing machine technology, multimedia/new media design, biotechnology, computer networking, computer help desk, software development, journalism production, ophthalmic medical assisting, substance abuse education, certified nurse aiding, and therapeutic recreation. The MxCC Foundation and MxCC Financial Aid Office provide tuition support to MxCC students, granting financial aid to 84% of students applying for assistance. A new Center for Science, Health and Wellness underlines Norwalk Community College’s continued growth and support of programs serving student career development since it became Connecticut’s first two-year public college in 1961. Today’s certificate programs foster career development in allied health, art/architecture and design, business, communication arts, computer science, early childhood education, and social/behavioral sciences. Individual NCC certificate programs are accredited by national organizations that evaluate legal assistant, nursing, respiratory care and engineering technology and other curricula. Each year, NCC awards more than $11 million in student aid in national and state loan, scholarship and grant programs. Studying in a vocational program at Asnuntuck Community College is a great opportunity for a student who wishes to complete school as quickly as possible and immediately integrate themselves into their field of choice. Since being established in 1974, Asnuntuck has awarded almost 8,000 degrees to its students. 19 Associate degrees, of either arts or science, are offered at Asnuntuck, as well as 23 different skills certificates. A variety of student organizations, including Greek life, multiple magazines, and special interest clubs, make life on the Asnuntuck campus even more enjoyable. Cheap tuition allows students to earn a degree without the accustomed financial stress of a college education. With over 130 years of experience in providing students with the fundamental knowledge required to become an integrated member of the medical industry, Bridgeport Hospital School of Nursing would be an excellent choice for any student interested in allied health. Bridgeport uses applied teaching methods to train its students, giving them plenty of time in the hospital to become familiar with the ins and outs of hospital employment. Students will also be able to give back to their community with numerous community service events. Merit-based financial aid comes in the form of scholarships and grants, and is available to Bridgeport students that meet certain requirements. The Connecticut education system has career training integrated into many of its schools’ curricula, but the state also offers many secondary and postsecondary schools specifically dedicated to vocational and trade training. The Connecticut Technical High School System is comprised of 17 technical high schools that not only provide trade and vocational education to teenagers but also offer career training, education and apprenticeships to adult learners. Connecticut also has 19 agriculture science and technology education centers and career and technical education (CTE) training at 12 community colleges throughout the state. Students interested in vocational and trade schools in Connecticut can use this search tool to help them find the right CTE school. 131,884 secondary students and 80,023 postsecondary students were enrolled in a Connecticut CTE program during the 2013-2014 school year. The Connecticut Technical High School System (CTTHSS) was awarded the Partnership District Award by the National Network of Partnership Schools at Johns Hopkins University in 2012, 2013, 2014, and 2015. Oliver Wolcott Technical High School, a school within the CTTHSS, was awarded the Partnership School Award by the NNPS in 2014 and 2015. Connecticut offers 16 national career clusters and 34 career paths for vocational and trade students. Because of Connecticut’s extensive secondary vocational and trade school system, students can gain practical workplace skills and earn certificates in their programs of study while still in high school. This can explain why one-year certificates are the most popular subbaccalaureate—below a bachelor’s degree—CTE credentials in the state. About 45 percent of students who graduate from the Connecticut Technical High School System continue their educations at the postsecondary level. Connecticut’s College Career Pathways program, Early College Experience program, transfer agreements between the Community-Technical College (CTC) System and the Connecticut State University System and the University of Connecticut all make pursuing associate’s and bachelor’s degrees easier for those who wish to continue their education. The following table illustrates the proportion of undergraduate credentials earned by Connecticut students compared to the national statistics. Connecticut’s employment increased 1.35 percent between 2014 and 2015, reducing the unemployment rate from 6.3 percent to 5.2 percent. Vocational students in Connecticut can expect employment to continue its upward climb, especially for those looking to become licensed practical nurses, medical assistants or radiologic technologists. The table below shows the occupations with the most job openings in Connecticut for people with some college experience and for people with associate’s degrees. Bridgeport, CT offers three postsecondary schools geared toward vocational and trade education: Bridgeport Hospital School of Nursing, Housatonic Community College and New England Tractor Trailer Training School of Connecticut – Bridgeport. The city is also home to the Bullard-Havens Technical High School and the Bridgeport Regional Aquaculture Science and Technology Education Center. These schools generally have very small student bodies, except for Housatonic Community College, which boasts about 5,200 students. Housatonic Community College is also the only institution in Bridgeport with part-time students making up the majority of enrollees. As with Connecticut as a whole, healthcare and social assistance occupations are very popular in Bridgeport, with a 2014 annual employment of 12,553. Also popular are manufacturing, with employment at 3,996 and retail trade at 3,011 workers. The Connecticut faction of the largest national association promoting career and technical education. Provides information and resources regarding career-focused education in Connecticut and works with local governing agencies to ensure the growth, promotion and funding of career and technical education programs. Provides information about the educational standards for secondary vocational education programs, including articles and videos for educators and students. Has many comprehensive tools that allow users to learn about Connecticut’s labor market, research careers and education programs, connect with employers and find jobs. Provides detailed information about state CTE funding, legislation, performance standards and results and professional development. Also provides resources regarding career clusters and pathways. Has information about the technical high school system and adult CTE programs in Connecticut. Comprehensive job search platform for those seeking employment in Connecticut. Includes salary information and resume help for job seekers. Provides a detailed overview of CTE missions and education programs in Connecticut. Includes information about programs of study, funding and transitioning between institutions.